How’s this for timing? Saddam’s verdict to be read November 5–just in time for the midterm elections. I wonder if this was originally scheduled for Bush’s benefit. I also wonder if, with public opposition to the war now so great, if this will backfire by reminding votes of what is going on in Iraq. Horrified by escalating religious violence and alarmed by the Bush administration’s “faith-based initiatives,” which make government money available to religious organizations, atheists are coming out of the closet — and organizing. “Local groups are springing up all over the place,” said Ellen Johnson, president of American Atheists. Active groups have grown by about 90 percent over the past six years, she said. …atheism appears to be gaining ground also as a belief, not just a wave of political activism by those who fear the wall between church and state is being disassembled. Books challenging religion like Letter to a Christian Nation by Sam Harris and The God Delusion by Richard Dawkins have been best-sellers on Amazon.com. “Our primary conviction is that there is no supernatural world — there is only one world, the world that is the subject of scientific investigation,” Johnson said. While the religious right gets the bulk of the attention, anti-scientific viewpoints which in their own way are as superstitious as those of the religious right expressed by new age advocates such as Deepak Chopra have also been the subject of criticism among many liberals. Very few punches are pulled during this disturbing, eye-opening hour, written, produced and directed by Michael Kirk. And clearly Mr. Kirk and Jim Gilmore, who is credited with the reporting for the film, found no shortage of highly placed people who were willing, even eager, to talk about the disaster that many perceive American-occupied Iraq to have become since the spring of 2003, when President Bush declared victory there. 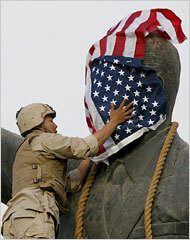 The film begins with the toppling of the statue of Saddam Hussein, a scene shown over and over on American television, and the portentous observation that “the Iraqis couldn’t pull it down themselves” because it was so heavy. So the American military helped. “The Lost Year in Iraq” doesn’t bother going into a discussion about whether the war was a good idea to begin with. It moves right to Baghdad’s fall in April 2003 and the looting that began hours later and soon “verged on chaos,” as the narrator says. “We were totally unprepared to secure the city,” says Anthony H. Cordesman of the Center for Strategic and International Studies.